BattleSwitch is the larger, 10A version of the popular PicoSwitch. BattleSwitch is a relay switch that you toggle via hobby radio control gear. You can use BattleSwitch to quickly and easily control glow plugs, BattleBot weaponry and more. You can activate applications with voltage levels as high as 240VAC without having to know anything about microcontroller logic levels or transistors because the relay offers full electrical isolation from your receiver electronics. 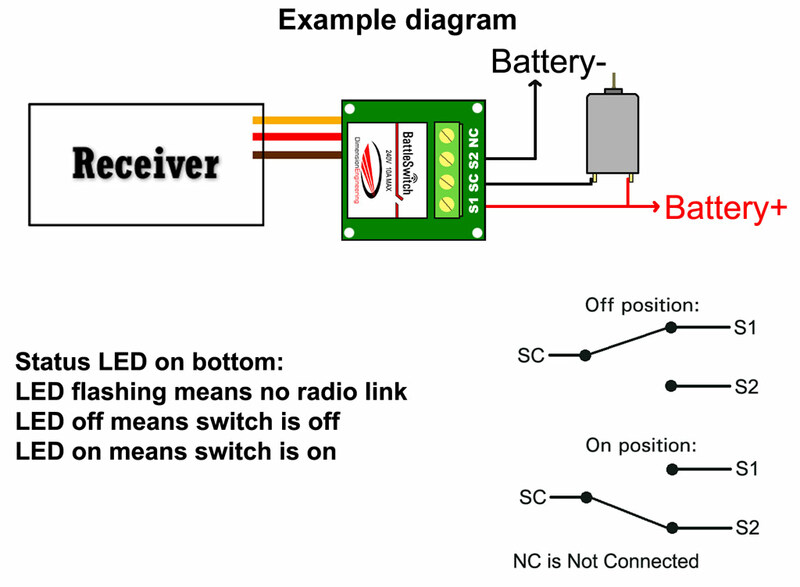 BattleSwitch plugs into a standard hobby radio control receiver as easily as a servo does. You connect the load that you want to toggle using BattleSwitch's wear resistant screw terminals. Depending on the channel you use, you will then be able to control the relay by moving your radio's control stick up or down, left or right, or another method you desire. Need something smaller? Try PicoSwitch. Size: 1.25" x 1.25" x 0.9"
Control of powerful auxiliary weapons in RC combat. Control of glow plugs in RC nitro vehicles. Control of high powered lighting systems on large RC aircraft, boats, cars. Control of domestic appliances and home automation. Control of non-critical automotive electronics such as glow wire. Control of nearly any application that can be toggled with a switch.